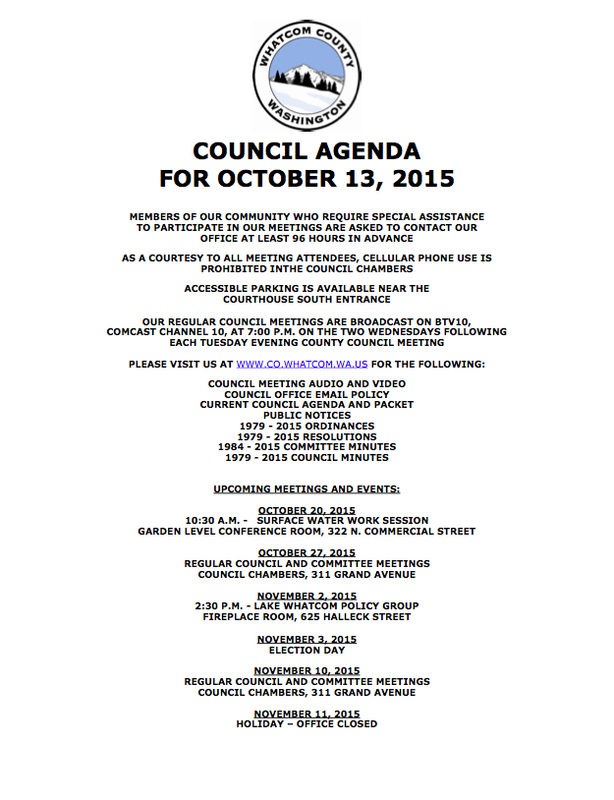 The next Whatcom County Council meeting will be held this Tuesday, October 13, 2015 at 7.p.m. Below is information from the agenda listing the Consent Agenda items for October 13. CONSENT AGENDA Items under this section of the agenda may be considered in a single motion. Councilmembers have received and studied background material on all items. Committee review has taken place on these items, as indicated. Any member of the public, administrative staff, or council may ask that an item be considered separately. This entry was posted in Information, Meeting and tagged Whatcom County, Whatcom County Council. Bookmark the permalink.